Iqbal Bano Pakistani Ghazals Music Singer. She was most popular Pakistani Classical Music, Folk Music Artist. She was great Artist of Pakistan and she create great name in Pakistan Music. Iqbal Bano trained in pure Classical Music and light Classical Music within the framework of Classical forms of "Thumri" and "Dadra". She was duly initiated Gaandaabandh Shagird of her "Ustad". Iqbal Bano was considered a specialist in singing the Ghazals of Faiz Ahmed Faiz. Iqbal Bano was later invited by Radio Pakistan for Classical performances. Her public concert took place in 1957, at the Lahore Arts Council. After marriage in 1952 Iqbal Bano moved to Multan and she started singing. She got Pride of Performance in 1974 from Government of Pakistan. 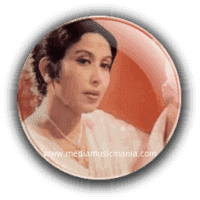 She was a star in singing soundtrack songs for famous Urdu Films "Gumnaam 1954", "Qatil 1955", "Inteqaam 1955", "Sarfarosh 1956", "Ishq-e-Laila 1957", and "Nagin 1959". I have selected below most Popular Music of Iqbal Bano. Iqbal Bano was born in Delhi India in 1935. She has sung in different languages such as Urdu, Punjabi, Saraiki and other languages she is great artist of Punjab Folk Music. She was very renowned and legendary Ghazals Singer of Pakistan. In the young age she started to singing and she got Music training from Ustad Chaand Khan of the Delhi Gharana, an expert in all kinds of pure Classical Music. This great Artist was died on 21 April 2009.